The average hand harbors around 150 different types of bacteria, but while most bacteria are harmless, there are some risks of infection if, for example, you touch your bare eye every day to put in lenses. Additionally, your eyes are more susceptible to harmful contamination when you wear contact lenses because of a lack of oxygen to the corneas, as well as the risks posed by lenses that have not been disinfected properly. 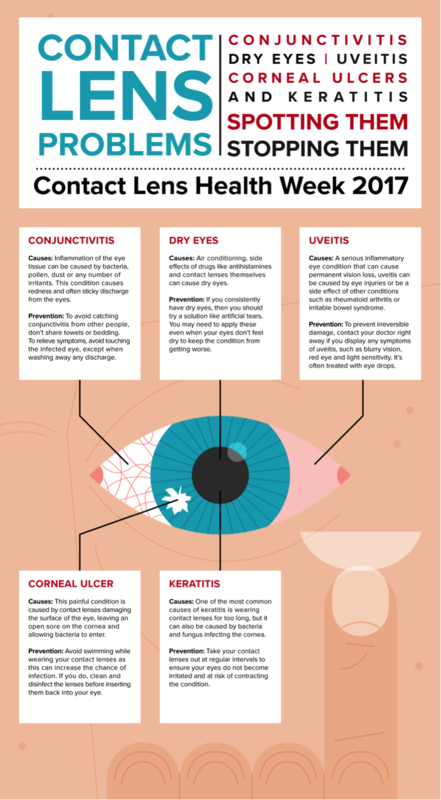 In honor of Contact Lens Health Week (21st-25th August 2017), the team at Visian® ICL™ looked into five of the most common eye complaints, how they’re caused, and how they can be avoided, so contact lens wearers (and everyone else) can ensure they keep their eyes safe. Find out more in our graphic below. Causes: Inflammation of the eye tissue can be caused by bacteria, pollen, dust or any number of irritants. This condition causes redness and often sticky discharge from the eyes. Prevention: To avoid catching conjunctivitis from others, don’t share towels or bedding. To relieve symptoms, avoid touching the infected eye, except when washing away any discharge. Causes: Air conditioning, side effects of drugs like antihistamines and contact lenses themselves can cause dry eyes. Prevention: If you consistently have dry eyes, then you should try a solution like artificial tears. You may need to apply these even when your eyes don’t feel dry to keep the condition from getting worse. Causes: A serious inflammatory eye condition that can cause permanent vision loss, uveitis can be caused by eye injuries or be a side effect of other conditions such as rheumatoid arthritis or irritable bowel syndrome. Prevention: To prevent irreversible damage, you should contact your doctor right away if you display any symptoms of uveitis, such as blurry vision, red eye and light sensitivity. It’s often treated with eye drops. Causes: This painful condition is caused by contact lenses damaging the surface of the eye, leaving an open sore on the cornea and allowing bacteria to enter. Prevention: Avoid swimming while wearing your contact lenses as this can increase the chance of infection. If you do, clean and disinfect the lenses before inserting them back into your eye. Causes: One of the most common causes of keratitis is wearing contact lenses for too long, but it can also be caused by bacteria and fungus infecting the cornea. Prevention: Take your contact lenses out at regular intervals to ensure your eyes do not become irritated and at risk of contracting the condition.